As the snow threatens to arrive, we gather in the last of the year’s harvest and take stock of our past growing season. And for FruitShare Barrie, our third successful season was a tale of exponential growth. save me the birds and the bees - please! At our Harvest Celebration a few weeks ago, volunteers and supporters gathered to share a meal and watch the film “Just Eat It”, a Canadian documentary about food waste, taking comfort in the knowledge that together we had prevented literally tonnes of food from going to waste in Barrie. In 2015, volunteers harvested 6,050 lbs of food of which 5,005 lbs (80%) went to local charities, the rest being shared by volunteers and tree owners. Over 10,000 pounds of fruit has been harvested since FruitShare started in 2013 when the initiative was launched as a project of Living Green: Environmental Action Barrie in partnership with Transition Barrie and the Simcoe Muskoka District Health Unit. Recipients of fruit this year included the Barrie Food Bank, Hillcrest Public School, and two new partnerships for 2015: the Barrie Native Friendship Centre and the Women & Children’s Shelter of Barrie. A new feature of this year’s program was the donation of homemade preserves to those in need. FruitShare volunteers made and donated jams, jellies, and tarts made from the fruit they harvested. The FruitShare Steering Committee would like extend a heartfelt thank-you to the volunteers, donors and partners for their enthusiastic support of the program. In numbers, our 2015 season included 65 volunteers, 50 Barrie-area homeowners who let us harvest on their property, and 9 types of local fruit: service berries, sour cherries, mulberries, currants, crab apples, plums, pears, apples, and grapes. FruitShare is now offering an exclusive benefit for tree owners, who offer up fruit from their trees for volunteers to pick, rather than it going to waste. A local arborist has volunteered to help maintain and prune trees in the program. FruitShare would like to thank James from Timberjack Tree Services for helping homeowners and improving the overall health of Barrie’s tree canopy. Barrie’s “Food Forest” is also growing! 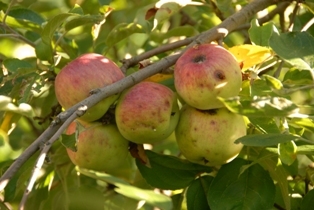 FruitShare is collaborating with the City of Barrie to plant more fruit trees on public land, where anyone can help themselves to free, healthy ripe fruit. Next spring, volunteers will plant 50 fruit tree saplings to add to the dozen planted last year, and more are on the way in future. FruitShare is still seeking local business sponsors to help fund the program, which is run almost entirely by volunteers and without government funding. Having one or several local businesses adopt FruitShare is key to our sustainability and growth. Businesses can showcase their support within the community with recognition on FruitShare brochures, shirts, lawn signs, public trees, and at our events. Potential sponsors are encouraged to call 705-715-2255 or email FruitShare.Barrie@gmail.com. Donations can also be made through the website at www.fruitsharebarrie.ca. With the number of local businesses who generously pony up to put their names on team jerseys, park fitness equipment, public buildings, or other worthy social projects, surely there is at least one who believes that rescuing local organic fruit and sharing it among the hungry is worth a few dollars? If you know of a business which might feel that way, please show them this article.